Kartchner Caverns ranks among the top 10 most beautiful caverns because of its colorful stalactite formations. With winter set to arrive soon, tens of thousands of folks will head into the great Southwest. Quartzsite becomes a huge desert yard sale, surrounded by upwards of 100,000 RVs, trailers and campers. Rock-hunting field trips and hundreds of dealers in minerals and lapidary goods cater to these escapees from the cold north. Scottsdale is invaded by a huge number of winter visitors, many of whom love classic cars, golf, and the gourmet foods offered by countless restaurants. In midwinter, Tucson becomes home to 100,000 mineral collectors and mineral and gem dealers. 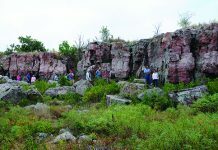 Winter visitors are constantly on the hunt for recreational activities, especially activities that are mineral-related. 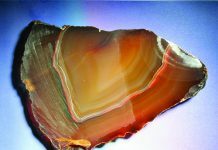 Approximately 40 gem and mineral shows take place in Tucson from late January to mid-February. Which brings up the question, What is there to do during the other winter weeks that involves minerals? Fortunately, there are underground mine tours, mineral museums, and limestone caves to be visited! 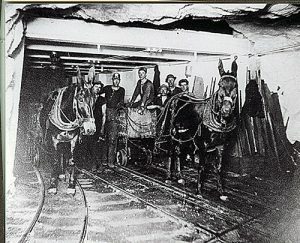 Before mechanization, underground miners used mules to haul the ore out of the Copper Queen mine. Two of Arizona’s more famous mining towns, Bisbee and Tombstone, offer underground trips for folks anxious to get a glimpse at what doughty miners did to earn living. Bisbee was, at one time, the greatest copper camp in the world. Beginning in the 1880s and finishing in 1975, miners extracted about 8 billion pounds of the red metal in the form of native copper, azurite, malachite, and a host of other copper species. Along with copper, the miners also extracted quantities of gold, silver, zinc, lead, molybdenum, and other minerals. You can get to Bisbee by taking Interstate 10 east out of Tucson. It’s about 50 miles to Exit 303, where you take state Route 80 south. Route 80 just happens to pass through Tombstone on the way to Bisbee. Signs will guide you to the Copper Queen Mine Tour. Be sure you dress warmly when you leave the warmth of the desert. The temperature in the Copper Queen mine runs about 55°F, cool enough to require a jacket. To take the tour, you board a small, open-seat train that heads straight into the Mule Mountains, far enough that you can see setups of mining equipment, view a huge open stope, and hear all about how copper ore was extracted. Before mechanization, underground miners used mules to haul the ore—mules that spent their entire life in the netherworld of mining. The tour, which lasts about an hour, only takes you along one of many levels in the mine. Above you on your journey are another 10 mining levels, which are eclipsed by the 33 additional levels below where you are! These levels constitute hundreds of miles of underground tunnels. Remember, many miles of these tunnels were dug by hand in solid rock—a remarkable achievement! 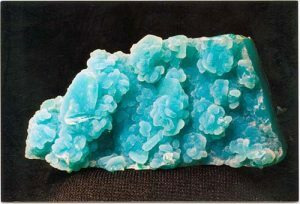 The late Senator John McCain's office display in Washington, D.C., includes an example of Arizona's blue chrysocolla. Countless specimens of the minerals extracted from these depths can be seen in museums in all over the world. You’ll see specimens at the Arizona Sonora Desert Museum, situated west of Tucson. The University of Arizona boasts a marvelous collection of Arizona minerals, including superb copper specimens. Right in Bisbee is the local museum, which boasts a superb collection of specimens. 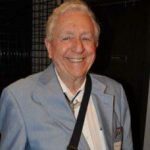 Unfortunately, the Arizona state mineral collection, once beautifully displayed in the State Museum near the state capitol in Phoenix, is no longer on display, but there are hopes it may see the light of day again. As you pass through Tombstone on your way to Bisbee, you can take advantage of any one of several mine tours offered there. Of course, Tombstone has plenty to offer tourists aboveground, such as the OK Coral, Big Nose Kate’s, the Bird Cage Theater, and more. And you have your choice of three different underground tours, depending on how much time you have and how adventurous you are. The Good Enough Mine Tour has an underground temperature of about 64°F. You’ll be underground for about 45 minutes, where you’ll enjoy seeing mining equipment, mining artifacts, and the reason for all the tunneling: silver ore.
One of the more productive mines here was the Toughnut, and you can take the Tough Nut Adventure Tour, which takes you underground for an exploratory three-hour tour. You’ll see some silver ore in place and learn how this precious metal was extracted, again, mainly by hand drilling and haulage. The really brave can also sign up for the Grand System Extreme Tour. This is a seven-hour ordeal into the more remote regions of the mines. You travel through significant portions of the over 300 miles—yes, miles—of hand-hewn rock tunnels, experiencing dripping water and scary darkness, and getting a real feel for what miners dealt with just to earn a dollar a day! Closer to Tucson is Colossal Cave, a limestone cavern with a great history. To get to Colossal Cave, take I-10 east from Tucson for about 20 miles to Exit 279 and go north on E. Colossal Cave Road. This natural limestone cave was known to Native Americans perhaps 1,000 years before Europeans arrived. Keep in mind that the desert gets into the 110°F to 120°F range in summer. A cave with an average temperature of 70°F has to be a popular home. In more modern times, train robbers may have used the cave as a hideout, so the cave has a history worth hearing about. The vivid colors seen in this Kartchner Caverns limestone flow are due to dissolved mineral salts. formations: stalactites, stalagmites, flow stone, and other oddities formed from flowing and dripping water. If the 45-minute walking tour does not seem challenging enough, you can sign up for the very strenuous tours that are occasionally offered. These challenge your climbing and scrambling abilities and take you deeper into the wonders and mysteries of a natural cave. The tour that is the jewel of Arizona’s underground experiences is at Kartchner Caverns State Park. To reach this amazing limestone cavern, which is considered one of the most beautiful in the world, go east from Tucson on I-10 for about 32 miles and take Exit 302 for state Route 90. Go south a few miles to the park in the Whetstone Mountains. Kartchner Caverns State Park is Arizona’s newest park. The caverns were discovered by two amateur spelunkers in 1974, who recognized the need to keep their discovery a secret in order to protect this amazing natural wonder. The fellows convinced the state to buy the ranch property, preserve the caverns, and open them as a tourist site. Kartchner Caverns consists of two cave areas. The smaller area is open all year ’round to visitors. The larger area is open only part of the year, since thousands of female bats fly in from Mexico in spring and use the cavern to breed and as a training ground for their young. Oddly, it was the bats who gave away their underground lair. The spelunkers had decided to explore a small depression in the side of the mountain. Sitting there, they smelled bat guano and knew they had something. A small opening was enlarged, and the two fellows crawled on their stomachs for about 100 yards through a small tunnel, which opened into a wonderland of amazing beauty. I was fortunate to be invited to serve on a Kartchner Cavern Advisory Council while work was being done to turn the caverns into a tourist attraction. 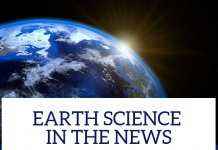 We were charged with fundraising for educational materials and docent equipment in preparation for the opening of this amazing underground adventure. Being part of this small group allowed me into the caverns long before the public was allowed in. I took photographs, which is no longer allowed, and thrilled to the sites I saw. Efforts to protect the caverns were so strict that, when one of the construction workers snapped off a small stalactite to keep, he was fired on the spot. What makes Kartchner Caverns so gorgeous are its colors. The groundwater that slowly worked its way through the limestone carried with it dissolved minerals like iron oxide, which later colored the cave formations that water formed. 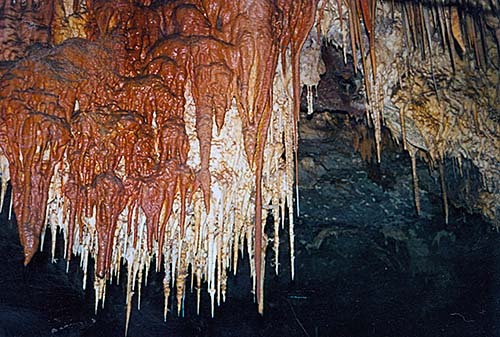 Stalactites that are bright-orange and yellow sharply contrast with the quite ordinary tan formations and give the caverns a beauty beyond most such creations. 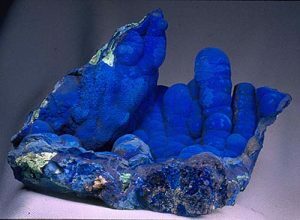 Bisbee produced 8 billion pounds of copper from minerals like azurite. On the Throne Room tour, which lasts about an hour and a half, you’ll see Kubla Khan, the free-standing monster stalactite that sits in the middle of a monster cavern. A small seating area has been created, and you can be entertained with a stunning light show while listening to restful music and enjoying what nature has wrought. Elsewhere in the cavern are narrow, white, curling helictites and soda-straw heliotherms, one of which is over 20 feet long—the longest known such feature. 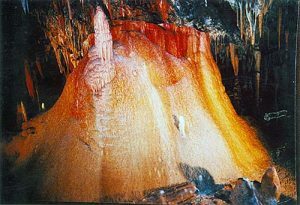 A Second Rotunda Tour takes you into the larger section of Kartchner, a vast space with myriad limestone formations, most of which are far more colorful than similar formations in other caverns. It is these colorful formations that rank Kartchner among the world’s top 10 caverns. 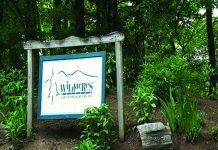 As a state park, Kartchner offers camping, a short movie on how the caverns were developed, a dining area, and a gift shop. Associated with the caverns and their discovery are true stories that are worth repeating. When the men who found the caverns were trying to convince the state to buy the property, they invited the governor to visit the caverns. The problem was that, to get to the caverns, you had to crawl through their original access tunnel. The governor could do that, but he had a bad heart and the fear was that, if he had a heart attack in the caverns, there would be no way to get him out. Therefore, an access tunnel had to be dug before any dignitaries could enter. My favorite story is about the original owner, Mr. Kartchner. He often rode around his ranch, including the area under which the caverns existed. It seems that, when he was riding over the cavern area one day with a companion, he commented that the mountain sounded hollow underfoot. 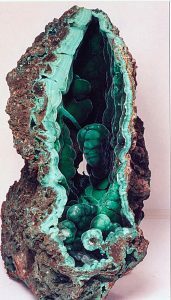 Lovely green malachite is one copper mineral you might see on the Copper Queen mine tour. one of Arizona’s major industries, copper mining. Folks who visited Senator McCain in his office in Washington, D.C., are very well aware of Arizona’s important copper industry. This is beautifully demonstrated by a cluster of wonderful copper minerals that were on full display in McCain’s office. In a glass wall case were several copper items on display: a processed cube of pure copper extracted from 1 ton of copper ore; two fine, crystallized copper specimens from the new Cornelia open pit, in Ajo; a superb bornite (copper sulfide) specimen from Bisbee; specimens of stunning blue azurite and green malachite from Bisbee; and a very colorful specimen of chrysocolla, a copper silicate, from Mohave County. The next time you are in Arizona and have enjoyed the mineral shows, stay a little longer and check out the mine tours and caverns, open for all to see.